Becak is the cycle rickshaw in Indonesia. These three-wheel modes of transportation are widely used in cities of South, Southeast and East Asia. The normal capacity of Becak was two passengers and a driver. 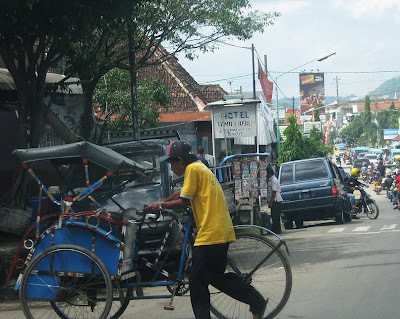 Usually there are two kinds of becak in Indonesia: becak with the driver behind the passenger (Java island) and becak with the driver seating side the passenger (Sumatera island). According to the rudder, there are also two types of becak: the paddle becak that uses bicycle and the motorized becak that uses the motorcycle as the rudder. Nowadays, many city governments forbid becak on the city’s main streets. But in my hubby’s home town, you still can see becak on the main street, like this one that I captured about three weeks ago. Have you ever ridden this kind of transportation? Thanks for sharing some of your Indonesia. I have seen the Becak in movies. Happy MYM! When I was young, there were the Sumatran type in Sibu. We felt embarrassed when our grand ma was on it. Now in Singapore, and New Zealand it is a hot tourist thing. Great shot! Thank you for sharing. looks like in our village....I miss Philippines! My husband will visit your country this November, i know he could take one of those. Enjoy the ride.